THine Microsystems, Inc. was founded in 1991, the predecessor of THine Electronics, Inc. In the initial years, we attracted significant attention from the industry as the “Leader for semiconductor venture companies.” This was initially driven by our success in the commercialization of the LVDS SerDes IC. It was adopted by many PC or TV manufacturers, allowing us to achieve a great leap. This article introduces some stories behind the development of the SerDes technology we have achieved. Digital equipment, has always improved its processing performance. The performance of microprocessors has improved dramatically, memory capacity has multiplied continuously, display resolution (number of pixels) in liquid crystal panels has increased, and the number of imaging pixels in image sensors has been on the rise. If the performance of each function is enhanced, the signal wiring that connects those functions requires ever-increasing speed because the data amount to be sent per unit time increases. However, the speeding up of signal wiring is never easy. This is because the data flowing in the signal wire is digital signal but it actually behaves like analog signal. If the signal waveform deforms, data cannot be transmitted correctly. Also, data may mix with that flowing in an adjacent signal wire, or electromagnetic noise (EMI) may radiate to the outside. These problems, “inability of proper signal transmission,” began to happen frequently in the frontline of digital equipment development from the mid-1990s. We even saw makers who were unable to solve a problem and were forced to give up shipment. In another case, a liquid crystal panel manufacturer, which received a lot of orders for laptop PCs, found that the panels had a problem and became unable to ship them anywhere. The manufacturer at a loss resorted to selling them on the market at cheaper prices, causing a nosedive in the market price of liquid crystal panels. The savior that solved these troubles appeared in 1995 – Serializer and Deserializer which used the physical layer of LVDS, that is the LVDS SerDes IC. Because the voltage swing is low, the signal transitions take place fast, enabling high-speed transmission at low power. In addition, the differential system cancels common mode noise and, at the same time, reduces EMI. 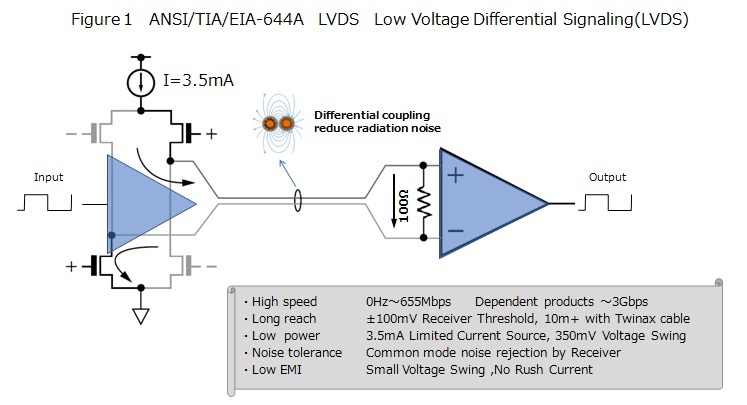 Compared with the conventional single-end transmission system at the level of TTL/CMOS, VDS SerDes IC transmitted data tens of times more quickly while reducing EMI with less power consumed. At present, the data transmission speed in the LVDS physical layer is set as 655Mbps at the maximum by the ANSI/EIA/TIA-644 Standard, but the product is actually used also at several Gbps. The number of pixels in the laptop PC liquid crystal panel, for which THine’s product was adopted at that time, was 1024x768 (XGA). The color depth was 6 bits for each of the R, G, B components and the pixel rate was 65MHz. In this case, the data transmission speed for the image interface reached 1.3 Gbps. This speed was difficult to be dealt with by the conventional single-end transmissions system, which adopted the parallel bus structure. Then, the LVDS SerDes IC appeared as the savior. Specifically, three lanes were used to transmit 6 bits of RGB image data, along with 21 bits of vertical synchronizing signal, horizontal synchronizing signal, and D signal, while the remaining one lane was used to transmit the clock signal. THine Electronics launched the LVDS SerDes IC in February 1997 and it was adopted in many liquid crystal monitors for laptops and desktop personal computers. At that time, competitors also had already commercialized their own LVDS SerDes IC, but THine’s product offered a rich array of circuits with low EMI radiation and excellent jitter characteristics. These features were evaluated and THine’s lineup was adopted by domestic leading PC manufacturers, and soon after that, by major consumer equipment manufacturers for their flat-screen TVs. Literally, LVDS became synonymous with THine Electronics. Digital equipment never stopped being upgraded in terms of performance. The number of pixels in the liquid crystal panels continued rising, from XGA to SXGA (1028x1024), to UXGA (1600x1200) and then to WUXGA (1920x1200). As for the color depth as well, a shift from 6 bits to 8 bits for each R, G, and B became common. The data transmission speed of the image interface was increasing, accordingly. As the speed of the image interface increased and liquid crystal panels enlarged, it became difficult to transmit data with the existing LVDS SerDes IC because the data signal and clock signal became hard to synchronize. 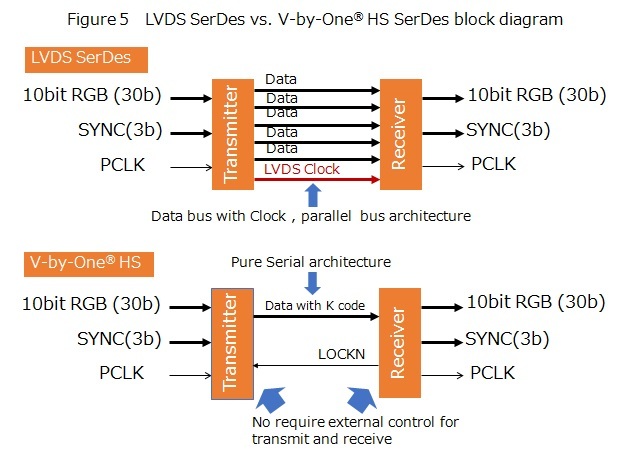 As described above, the LVDS SerDes IC sends data signals and clock signals via separate differential lines, as in the case of the parallel bus system. Because of this, as the speed increases, the transmission waveform more easily deforms or distorts. When panels grow in size, cables lengthen, easily causing a difference in the length of the transmission path. If it results in a lag between the times when the data signal is received and when the clock signal is received, data cannot be transmitted properly. This led to the emergence of the embedded clock technology which transmits both data signals and clock information via a single differential line. Because both are sent via the same differential line, a time lag between receiving data and clock signals can hardly occur logically, even if the transmission speed increases. The technology made it possible to cope with higher speed image interfaces. However, the resolution of flat-screen TVs increased to 1920x1080 (HDTV), the frame rate doubled (120 fps) and soon quadrupled (240 fps), and the resolution further increased to 3860x2160 (4K2K). As a result, even faster image interface speed was required. If two or more lanes are used, bandwidth for data transmission can be expanded significantly. After V-by-One® HS was commercialized in 2009, new models of 1920x1080 liquid crystal panel for HDTVs with double speed or quadruple speed were launched one after another. This promptly led to a wide adoption of V-by-One® HS. It helped to expand the market for flat-screen TVs. Through commercialization of the LVDS SerDes IC and V-by-One® HS, THine Electronics consolidated its position as the manufacturing leader of interface IC for liquid crystal panels. At present, the products are used for the image interface not only in flat-screen TVs but also in multifunctional printers, on-vehicle video equipment, security cameras, and machine vision cameras. We would like to note that neither the LVDS SerDes IC nor the V-by-One® HS is a technology only for the image interface. 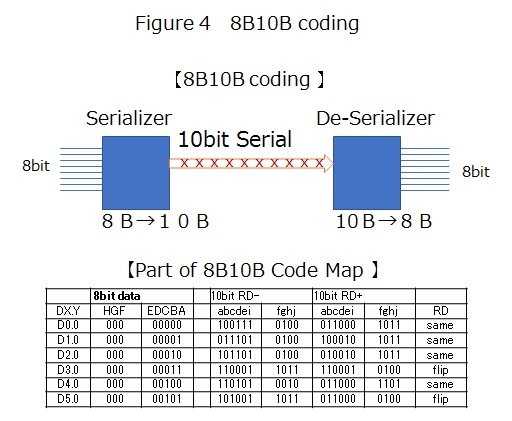 Both LVDS and the 8B10B coding are general data transmission technologies. Therefore, both can be used for a general high-speed interface that connects point A and pint B. Then, how can SerDes IC such as the LVDS SerDes IC and V-by-One® HS be used in other application areas by designers of electronic devices to obtain large benefits? We would like to explain in detail about each SerDes IC product in the following articles. You cannot escape from EMI in large data transmission age, but here is a solution of reducing EMI using CDR technology. The number of the cables between IC board always irritates engineers. THine Electronics solution for this issue has been accepted by great number of customers. In choosing ICs, it is important to reduce costs. From many options THine Electronics offers, you can find not only the best performance, but the best cost reduction. Decision of Interface makes the size of your business. What is the most desired interface? Please see an example of THine's solution with its deep know-how in the industry.